As I said, I was starting to feel pretty confident with this channeling thing we had going on here. For somebody who, as a rule, finds most channeled material to be mindless psychobabble at best, or insidious disinformation leading to destruction at worst, I was becoming rather fascinated by the material the Cassiopaeans were delivering. After a couple of years of holding everything they said in deepest suspicion, looking for the flaws, being a super skeptic, I was now beginning to think that I had invented the wheel! After all, it seemed they could hold their own in a discussion with a “real” scientist; they produced information that was initially thought to be incredible or nonsense, which then checked out in amazing ways; and most of all, they very carefully avoided any kind of interference in our personal lives in a direct way, while the information they were imparting to us, if considered and added to our criteria for evaluating our reality, seemed to help enormously in sorting through problems and understanding what was going on under the surface. They were, in effect, not giving us fish, but teaching us to fish. And, of course, with this growing confidence, I decided to run a tighter ship, so to speak. No more fun and games. Let’s get right down to business here and solve this puzzle and go home! Q: (L) Well, I would like to get directly to my questions as they have developed during the past few days. The first thing is in regard to the Santilli session: is awareness equal to gravity? A: It is a part therein. Q: (L) Does accumulation of knowledge and awareness correspond to an increase in gravity? Q: (L) You said that energy can change the value of the density. The value of the density, as I understand it, is either plus or minus. Does this mean that pumping energy into third density from another realm of space/time can intensify the gravity to such a state that it changes its unit and becomes antimatter? Q: (L) You said that EM was the same as gravity. Does an increase in EM, the collection of EM or the production of an EM wave, does this increase gravity on those things or objects or persons subjected to it? A: Gravity does not ever get increased or decreased; it is merely collected and dispersed. Q: (L) If gravity is collected and dispersed, and planets and stars are windows, and you say that human beings “have” gravity, does that mean that the human beings, or the life forms on a given planet or in a given solar system, are the collectors of this gravity? A: No. Gravity is the Collector of human beings and all else! Make “collector” singular. Q: (L) Is STO the equivalent of dispersing gravity? A: No, STO is a REFLECTION of the existence of gravity dispersal. Q: (L) Is STS also dispersal of gravity? A: No. Collection is reflected. STS is reflection or reflected by collection of gravity. Q: (L) You said that changing the unit involves movement to another density. You also said that antimatter realm is the door to, or the pathway to, ethereal existence. Is fourth density, therefore, an antimatter universe? Q: (L) Do the beings in fourth density manifest in an antimatter state? Q: (L) Is fourth density a density where both matter and antimatter are in balance? A: Not in balance, in evidence. Q: (L) So matter and antimatter are both available for utilization by individuals according to will and awareness? A: Close. Antimatter and matter are balanced everywhere. Q: (L) You say that increasing awareness was “a part therein,” of gravity. So, if a person is increasing awareness, do they also increase in gravity? Q: (L) What is the relationship between the increasing awareness and gravity? Q: (L) We have two parallels… Okay… So if one is exponential increasing in awareness, the sign of the units of bodily energy does not change? A: You are still attempting to generate. A: Then change the thought pattern. Gravity is the “stuff” of all existence; therefore it has an unchanging property of quantity. Q: (L) So, gravity is not being “used,” per se? A: Close. You can utilize gravity, but you cannot “use” it. You cannot increase or decrease that which is in perfectly balanced static state. Q: (L) So, gravity is in a perfectly “static” state. Yet, it can be “utilized.” Can you make clear for me the transition from the static state to utilization? What occurs? A: There is no transition, just application. Q: (L) What occurs from the perfectly static state to the application mode? Is anybody following me? Q: (L) Wonderful! What I am trying to get at is, 1) gravity exists in a static state; 2) light is an energy expression of gravity, therefore it is utilization? Correct? A: No. Light is an expression of gravitational energy. A: It does? If a tree falls in the forest, and nothing is there to hear it, does it make a sound? Q: (L) You are saying that gravity is everywhere in balance and static, and then you say that utilization causes unstable gravity waves. And then you say that gravity is God, and that God is all creation, and we are a part of all creation, and, therefore, we are of God, and gravity. So, what I am trying to get at here is: what is the thing, the event, the manifestation, the mode of utilization that takes gravity from a perfectly static state to an unstable state, if you are saying it is always perfectly balanced. That does not make sense to me. A: Instability does not automatically mean non-static. Unstable waves can be static in their instability. Q: (L) None of this makes a whole lot of sense. I thought I was beginning to understand it, and obviously I don’t have a clue. Let’s try a different direction. You said that the universe consists of equal amounts of matter and antimatter. Are the first three densities, densities of matter? Q: (L) Are there equal amounts of matter and antimatter at all densities? A: Yes. Remember, density refers to one’s conscious awareness only. Once one is aware, ALL [many spirals of the planchette] conforms to that awareness. Q: (L) What is it about the oncoming Wave that is going to make any given person aware? Q: (L) Are manifestations in third density simply loci of collection of gravity? A: In part. But, so are manifestations on all densities. What do you suppose the opposite of gravity is? Q: (L) So, if all that exists were like a blown up balloon, and the surface of the balloon represents the static state of gravity, 7th density maybe… and it begins to bump out in different places… and all these little bumps are loci of manifestation of various densities — and this is very simplified, I am just trying to get an image — is this getting, even very simplistically, to an idea that I can work with? A: As long as you have an “antiballoon” too. Q: (L) Two balloons next to one another? Q: (L) The nonballoon is when the balloon switches off — but it does it so fast you are not aware of it — like a pulsation…? I mean… I am desperate here! A: You see, my dear, when you arrive at fourth density, then you will see. Q: (L) Well, that leads us right back to: what is the Wave going to do to expand this awareness? Because, if the wave is what “gets you there,” what makes this so? A: No. It is like this: After you have completed all your lessons in “third grade,” where do you go? Q: (L) Swell! My night would not have been complete without that! Do the lessons have to do with discovering the meanings of the symbology of third density existence, seeing behind the veil… and reacting to things according to a true free choice? Giving each thing or person or event its due as the Sufis teach? Q: (L) I just want to make sure that I am doing the most I can do. I don’t want to have to come back to third density. A: That is just the point, Laura! When it is a struggle, you are not learning. So stop struggling and meditate i.e. enjoy the ride. So, I fell into the pit of ego — I thought I had a clue. But how the dickens can you stop struggling and “enjoy the ride” when the whole world seems to be an out-of-control train heading straight for a bridge that has been washed out by a dam that has collapsed in a torrential downpour? At least that is what it seemed like at the time. I needed to understand. I needed to know what was going on here on the Big Blue Marble. I really needed those answers! So, since the Cassiopaeans had suggested that I do research on gravity waves, that is exactly what I decided to do. I went to the library and struck out. Nothing there. I did a rather primitive internet search (I wasn’t very computer smart at the time) and found a couple of odd references that made no sense, and finally decided to do something rather more daring. I figured that Dr. Santilli must be the answer! If he had lost interest in the Cassiopaeans, maybe I could rekindle it. I put together the material from the Santilli session with the subsequent gravity wave material delivered over a year later, and typed it all up very nicely and faxed it to him along with a request that he have a look at what had come up since he had visited. I was sure he would be interested and things would just take off from there. Nope. Barely a flicker of a response. Okay, Plan A flopped; Plan B: obtain permission from Dr. Santilli to use his name and then post the material on the internet in the hopes that someone would read it who knew something about gravity waves and would reciprocate with more information I could work with. Fortunately, he was gracious enough to consent, and I dutifully sent the whole sequence of remarks to Col. Steve Wilson for his opinion, and to ask if he would post it to his Skywatch mail group. Col. Wilson was very interested in the material, and the Cassiopaeans as well, since we had exchanged a number of previous e-mails on many subjects. It was his opinion that the Cassiopaeans were certainly revealing information that was accurate and that he could verify. But some of the information he could neither verify nor comment on. Col. Wilson posted the Santilli session to the mail group on June 27, 1996, and I settled down to wait and see if anyone who could point me in the right direction for my research would read it. The subject field of the message read: “Dr. Roger Santilli and the Cassiopaeans…” I thought it was catchy enough that people wouldn’t just delete it out of hand. I admit to having been more than a little paranoid about sending this material out this way. After all, I had already experienced some pretty vicious attacks from various sources that I will detail another time, and it was clear to me that there was possibly some danger to myself in making public the Cassiopaean information in some of the more “sensitive” areas. But, I was desperate, and understood that being desperate called for desperate measures. Nothing happened. Nobody commented on the post. Nothing was said by a single soul on that supposedly humongous mail group. I had played my cards and lost. There would be no more information about gravity waves. The Fourth of July was coming up and my aunt invited me to come to her house to celebrate since there were also a couple of family birthdays — one on the third and one on the fifth — so we were going to do the whole family celebration thing and go to a fireworks exhibition and barbeque. I was pretty depressed but the kids wanted to go, and since I was finally recovering somewhat from my months of disability, I thought I would chance it and make the trip. Besides, my cousin is an aerospace engineer and I had decided that I would sort of “come out of the closet” about my channeling activities and enlist his help in looking at the material and seeing if he could come up with any “real” physics or math that would further the project. Heck, who knows? Maybe he would know something about gravity waves! So, we went. It’s about 150 miles there and usually takes over three hours with the traffic, but it seemed like a lot less with the kids so excited and happy to be “on the road.” We barreled along through the North Florida woods with the tape player blasting us with U2 and Pink Floyd all the way. I must have heard “Are we there yet?” at least a hundred times. The barbeque was nice and I won a fishing rod in a raffle for the local volunteer fire department. The kids had a great time with the cousins, but I was tiring rapidly and couldn’t keep up with all the activity. My aerospace engineer cousin either knew nothing about gravity waves or thought it wasn’t a suitable subject to discuss with a woman. His attitude seemed to be humorously condescending, so the conversation went nowhere. So there I was, wandering around in the heat, humidity, and bugs, wondering just what the heck was I going to do next. We stayed overnight and I had a strange experience there sleeping in a strange bed. I was feeling so completely alone — more than I ever had in my life — and I wanted so badly to solve these problems about our reality, our existence, our place in the universe, but I just couldn’t seem to connect with a single, solitary person who was as driven as I was to understand Why? How? And all that. I actually began to cry from the frustration and I was shouting the question at the universe in my mind. It seemed to echo and re-echo endlessly into the vastness of space, which frightened me, but then an odd sensation of comfort, of destiny seemed to settle over me like a blanket. I just knew that an answer would come if I persisted. The strangest feeling of disconnectedness from that environment of mindless celebration grew in me all through the next day, and I got more and more restless with each passing moment. I felt like I was going to jump out of my skin. Finally, I could stand it no longer and I told the children that as soon as the fireworks were over we were going home. Thankfully, they were tired enough from all their activities that the thought of sleeping in their own beds made them agreeable, and we made our apologies for not staying the full three days and headed out with the last “rocket’s red glare” showering down over the softball field in that little backwoods, North Florida town which boasted a single traffic light but one of the best fireworks shows I have ever seen! On the road again. Night driving in the Florida backwoods — one of life’s great pleasures. Minimal traffic, soft scented air blowing in the windows, smooth, two-lane blacktop between towering pine trees for miles and miles. The children were soon asleep and I drove straight home, arriving not long after midnight. I put everyone to bed and had a long, relaxing soak in the tub before putting myself to bed. But, just before turning in, I decided to check my e-mail to see if anybody had sent me anything at all. “You have mail!” the computer informed me. Hi, Which is the address (e-mail?) of Dr. Roger Santilli? I would like to take a look at his papers. What a funny name! And what a funny feeling it gave me. Subtle, indistinct, like a small draft of warm air across my cheek. “Nothing,” my conscious mind scolded! After all, this person with the funny name only wanted Santilli’s e-mail, and had nothing at all to say about the Cassiopaeans. What a disappointment! But, it was the first “nibble” in the eight days since I had sent out the material. I swallowed my disappointment and decided to be as helpful as possible. The end result was this: indeed, the Cassiopaeans were correct when they said that our little demo at the MUFON meeting was “predestined.” Because it created a situation that caught the attention of Santilli, and because, a year later, I posted the Santilli session on a mail list on the internet, it was forwarded to a physicist who was interested in the Cassiopaean material. And not just any physicist — a physicist with a good reputation, a Humboldt Prize-Winning physicist with a list of publications as long as my arm, and a specialist in the areas necessary to work on the very problems that had haunted my mind all my life. Moreover, he was as driven to understand and solve them as I was. And, the curious fact is that he was actually writing about gravity waves in his research journal during the same time period that the Cassiopaeans were urging me to research them. He was sitting on a broken, ancient megalith along the side of one of his favorite walks in Firenze and he decided, on the day after I first wrote back to him, to go and photograph that stone as a sort of document of the event. 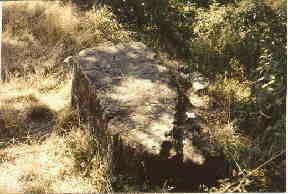 Above: The ancient megalith on which Ark was sitting while writing in his research journal about gravity waves. 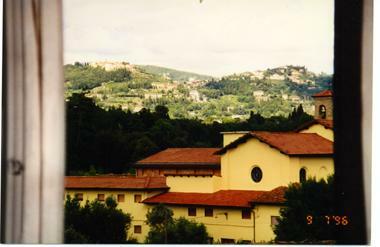 Above: The view from Ark’s office window in Firenze. The buildings of the University there are very old — formerly a monastery. Another interesting thing is that one might even think that a physicist is a “spin doctor”. Certainly, the strange events I recounted in the chapter three, which occurred only after meeting Ark, suggest that this relationship was destined to “open the gates to the subconscious” in me. At a very early point in our relationship we agreed that our quest was the very thing that had brought us together, so we were certainly going to begin working together on it right away. Ark would read sections of the transcripts, and compose questions that he sent to me via e-mail. He would also ask questions about the many subjects that he had become familiar with in his own research. Nine days after that first e-mail, Ark participated in a session. In a curious way it brought us back around to the subject of The Wave. Q: (L) First of all, I have had some contact with a physicist who is interested in the material. And, because of this, I was motivated to pick up a book I had read many years ago about the German occupation of Poland, and there were some very strange things said in this book, and some funny synchronous numbers… It just seemed to be a prototype of the present reality in global terms. My question is: is there some synchronous implication between this contact, the reading of this book when I was eleven years old, and the material we have received through this source? Q: (L) You have said that the Holocaust was basically a ‘practice run’ for the ultimate space invasion. Was Hitler’s agenda a practice run for a future scenario? A: Close. Was a “testing” of the will. Q: (L) Whose will was being tested? Q: (L) Me specifically, or the planet? Q: (L) In terms of this scenario, is there some lesson that we can learn about what may or may not occur through this book I have mentioned? A: Maybe, but suggest you learn to blend mosaic consciousness. Q: (L) What is mosaic consciousness? A: Thinking in internally spherical terms, rather than using linear “point blank” approach. The whole picture is seen by seeing the whole scene. Picture yourself as being at the center of a mosaic. Q: (L) Okay, I know what you are saying, but I just don’t think that there is any way I can do this! Q: (L) Okay. Okay. This whole situation, this Polish connection, this German connection,1 the American and alien things, the soldier/Nephilim thing, these are all manifestations of a Realm Border Crossing, am I correct? Q: (L) And some of the manifestations of a Realm Border Crossing are that some people graduate or transition to fourth density, that their awareness changes, everything changes, the playing field is leveled. So, what happened in Germany was a ‘practice run’ but what is going to happen is that the ‘playing field’ is going to be leveled, so it will not be exactly the same scenario, is this a correct assessment? Fact four: What is to happen, as you state it, is a ways off, and will not occur until you have reached that point on the learning cycle, and you are not close yet. Q: (L) So, the events and circumstances of our lives, individually and collectively, can indicate where we are on this learning cycle? And we are asking to have things told to us, or revealed to us about things that are, in themselves, the necessary lessons? And it would be virtually useless to be told about them since they must be experienced? A: Partly correct. If you want hints, then hints shall we give. But, if you are looking for a “road map?” Forgetitski! Q: (L) Okay, we want some hints. And Ark wants some hints, too! He wants to know if we can invent a tool that enhances free will? A: No tool is needed because of facts 3, 4, and 5. Q: (L) Ummm… So, when a person is being hypnotized and controlled from outside, because that is the matter of concern we were discussing earlier, they are hypnotized and controlled until they learn to stop it? Q: (L) So, using the analogy of the Prodigal Son in the pigsty, they just have to wallow in it and suffer until they have had enough? A: Using your analogy of the bicycle: Is there a tool that makes it unnecessary for the child to learn how to ride the bicycle in order to know how to ride it? Q: (L) Ark also wants to ask… Well, his problem is faith, as he said it to me. A: Faith comes also from knowledge, and as we have stated before… False knowledge is worse than no knowledge at all!!!!! Q: (L) So, it is important to take each and every thing that is being learned or analyzed, and take it completely apart and dig in every direction around it, and even in related directions, to fully ascertain that it is true? As C.S. Lewis said, knowledge is like a rope… as long as you are using it to tie up a box, it doesn’t matter whether it is perfect or not, but if you have to use it to hang over a precipice, then it behooves you to make absolutely certain that it is strong enough to support your weight. Q: (L) Okay, Ark asks about this: “In 1979, Project Phoenix, with the assistance of the Grays, was successful in producing a mind amplifier.” Is this true? A: Possible. Now review: The “Grays” are cybergenetic probes of the “Lizard” beings, so just exactly who is doing the assisting? And who is behind the Lizard types?? Could it be your ancestors, perhaps!?! Q: (L) It says here: “The fire within man that is characterized as passion is the secret that can be utilized. The secret to all things is passion. With passion all things are possible. The amplification experiments of the Phoenix Project have been explained as having amplified brain waves. In fact, it amplified the passion of the subject. It was that “inner will” of the subject that was amplified, that inner spirit within all of us is that driving force is manifested as electrical energy. Master that force and you cannot be controlled, the universe is yours. Master the inner spirit and you shall master the physical.” Comments please. A: First things first: Who is doing the assisting? And how is the assisting being done?!!!!!!??? A: Assisting? Or maybe influencing?!? And if so, how so?!? And, is not this the whole point? Are you not ultimately influenced always?!? In EVERYTHING you do? We have stated thus numerous times… So, please let us not get off the track, okay? Q: (L) In other words, as long as we are in the pigsty, we are in the pigsty, and until we get out of it, we are in it? A: Until you reach that point on the learning cycle. A: That information you refer to is false in its entirety! “Passion” does not set one “free,” quite the opposite! Q: (L) But what if your passion is for knowledge? A: That is not passion. It is soul questing. Q: (L) What is it that gives some people this drive, this steamroller effect, that they are determined to get to the absolute bottom of everything and strip away every lie until there is nothing left but the naked truth? What is the source of this desire? A: Wrong concept. It is simply that one is at that point on the learning cycle. At that point, no drive is needed. Q: (L) So, you more or less are there because some critical mass has been reached that “jumps” you to the point where seeking truth is simply who you are? It defines the parameters of your being. Is it like a 360-degree circle, and each person is a different point on the circle, and the whole thing cycles, and you never change relative to the people behind and in front of you, and the only real thing you can do to help anyone is to move the circle by moving yourself, thereby pushing the one ahead of you up, and pulling the one behind you into your previous place? And where you are on the cycle determines what you do? A: It is a single cycle, yes. There is only one learning cycle, and where you are upon it, determines your EXPERIENCES, and vice versa. Q: (L) Is there ever any point where lines connect from one point on the cycle so that you can ‘jump’ from one point to another? Like a wormhole in space or something? A: Refer to facts 1 and 2 and 3. Q: (L) So, no short cuts? A: Now, refer to 3, 4 and 5. Q: (L) One thing, previously when we were talking about unstable gravity waves, and I asked what caused them to become unstable, you said “utilization”, and that STO was dispersion, and STS was “collection” of gravity. I have made a few conjectures about this and would like to ask, does this mean that in giving to others, even if what you are giving is a withholding of assistance because you know that assistance would only prolong the lesson, is dispersing gravity, and exerting mental or other control over others, even if one is unaware that they are attaching energy drains to another, also a form of collecting gravity? Q: (L) So, when you collect gravity, you become like a black hole, you cave in on yourself? Q: (L) And it seems to me that one of the objectives of what we are doing is releasing the gravity collected in ourselves? A: If that is your choice, or if that is your path. Q: (L) Is choice as intimately connected with the path, as I understand it? Is it just simply part of how you are configured in your soul essence? Q: (L) And there are people for whom STS is simply their choice. It is their path. Q: (L) So, it is a judgment and a disservice to try to convert someone to your path, even if you perceive the end result of the path they are on, that it leads to dissolution? It is still their chosen path? Q: (L) And, if you send “buckets of love and light” to such a one, and that is their path, you are violating their free will? A: You might as well send “buckets” of vomit, as that is how they will react. Judgment is STS. Q: (L) You told us before that stars and planets are portals, or openings into other densities. Is it possible that this oncoming wave, this Realm Border Crossing will be accessed through these types of portals, that it is not something that is actually in our ‘space,’ but that it would emanate through stars and planets? Am I onto something here? A: You may be starting down a long path. Just remember: All prophecies attached to calendar dates are useless unless you wish to be sucked up by the fourth density STS forces! Q: (L) Speaking of being sucked up by fourth density STS forces, MM was told by her local Hindu gathering that she was “vacuuming” up their energies and they invited her to either get with the program or find another group to hang out with. What kind of an interaction was this? Why were they so uncomfortable in her presence? A: Because they wished to be worshipped. Q: (L) Does that mean that being worshipped is the equivalent of sucking energy? Q: (L) Now, I am curious about the doggie image that was on the photo that MM took and showed to me? A: In these times, 2nd density creatures will collect more and more attachments. Q: (L) Are these attachments like other entities? Q: (L) When they are collecting these attachments, are they collecting them from us, as in protecting? Q: (L) Are they being used to collect attachments to be detrimental to us? Q: (L) Why are our animals picking up attachments? 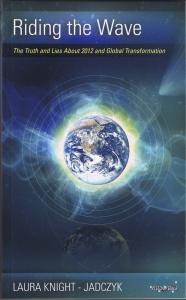 A: Because of vibrational frequency intensifications, i.e. The Wave. Q: (L) Is there something we could do? I mean, are we supposed to get rid of pets? A: We would never suggest something as harsh as this. However, beware: third density STS orientation includes the thought of “dominion” over 2nd density, and this is merely a continuation of the energy buildups of the approach of The Wave… Some of the lessons are interesting indeed. When you assume that capture and imprisonment of those of lesser capacity than you is for “their good,” why should not you expect those of greater capacity than you to assume the same regarding you?!? We would like you to ponder this further. We suspect there is much to be gained from insights lurking there. The Wave subject was put on hold at this point because so many “real life” activities took priority — such as working in the direction of Ark’s first visit and details about how to arrange our future so that we could work together in real space/time rather than in an amorphous virtual reality. But, when all of the matters finally began to sort themselves out, we eventually came back to the subject. But, by this time, we were learning that we had to do our homework, there was no free lunch, and the goal of solving the greatest mysteries of reality was going to be a pretty big project. What we learned makes up this series of books.